Update: Dems To Take Control of the House according to projections. Right now they have 18 wins. Republicans will keep control of the Senate. In Texas, Beto O'Rourke lost to Ted Cruz(even Beyonce's last minute endorsement didn't bring it home for him.) Ted Cruz is one of at least two Republican Senate wins Trump cannot take credit for (the other is Mitt Romney). On the flip side, I wonder if anyone is keeping track of candidates Trump campaigned for who lost? (Here's one: Bob Menendez thanks Trump for endorsing his losing opponent. Results and predictions are beginning to stream in. Here is the NY Times Live Results page. The AP, which is using a new system this year called VoteCast, says health care and immigration -- and Donald Trump -- were very significant concerns to most voters. Nate Cohen says turnout is very high. We'll know soon if the youth vote turned out in force this year. Bernie Sanders and Elizabeth Warren have won reelection to the Senate. Update: The Dems have picked up 2 seats in the House so far: Donna Shalala won in Florida, and Jennifer Wexton in VA. There is definitely a female blue wave crossing the country for the House of Representatives. news is Trump getting away with whatever he wants is over. The senate can defend him all they want but there are going to big stories to feed the press from the house. And there is still Mueller hanging out there. Lots of opportunities to place all kinds of provisions in spending bills. The Dems in the House stick together. This is by no means a certainty. I'd start by choosing a House Majority Leader who can bare knuckles FIGHT. I am happy with the result. We needed the House and we got it. Now we need to get some legislation passed in the House to set up the all-important 2020 election. That is where the Senate (and Presidency) will be won. Hopefully there will still be a few judgships available to fill at that point. the new House needs to pass some primo legislative dope that can be thrown in the faces of the president and senators who snub it in the 2020 races. That's gonna take a whole 'lotta gumption from House leadership. Eat your Wheaties Nancy and please spend more time finagling legislation as opposed to begging for money. in his race for the WI state legislature? Victory, I hope. that it was a late night at the local Dem party, with a computer modem problem in the city -- our hometown, where my brother was an alderman -- that was his strongest support. But in a ridiculosly gerrymandered (see Wisconsin case before SCOTUS) district across two counties, and one being infamous Waukesa County, it was not to be. But my little bro got a lot of gratitude for running a great race that so worried state Republicans, who thought that they had safely gerrymandered the seat for the incumbent, especiaaly as my bro was a first-timer for state office, that Republicans had to pour resources into the district. Their desperation also led to seriously slanderous statements and libelous literature from some outside PAC. But that meant fewer resources for other races, which Dems won, so the party knows that my little bro did make a big difference. And that Republicans really do not want him to run again -- exactly why Dems want him to do so. So, we shall see . . . especially any day now, when he will become a grandfather. That wee one will be in Chicago, so I suspect that my bro may find that being free to train there often, without a legislative calendar, will be a good thing. Grandkids always win out over other priorities, as we have found, to our great enjoyment. Anyway, as you can imagine, we in my schoolteaching and public-emplyee clan all felt like winners, by the wee hours this morn, when we finally knew that we had won back our Wisconsin from Perp Walker. Tony Evers, a schoolteacher and state superintendent of schools, and Mandela Barnes, a Milwaukee schoolteacher's son, were a politically brilliant ticket of opposites, otherwise -- and that we also won the AG race was a late-morning gift today. Josh Kaul's mother was our first woman AG. Sadly, owing to breast cancer, she did not live to see this day. But he will live up to her record as a fierce fighter in the good fights. So did my little bro, as a litigator for the EEOC. Since, he has founf a lot of other good fights to wage, too, as a volunteer, so he doesn't need to be in office to be a winner. It is disappointing in that several of the high profile races did not turn out for Democrats, albeit they were very close. But taking the House has saved democracy for America. That is the big picture. and the Notorious R.B.G. going strong for two more years (or 1 year by Cocaine Mitch precedent) might keep Lady Liberty's nose above the flood waters for a little bit longer. is high maintenance requiring constant gardening. And, it is fragile with no long term guarantees. I think of the familiar quote attributed to Benjamin Franklin when asked by citizens what sort of government the constitutional delegates created, he responded: " A republic,if you can keep it." Mitch McConnell is trying to list the bipartisan bills he worked on since 2016, and don't, he blames the press. He says the press doesn't cover things they work together on and then began to sweat trying to list those things that weren't reported on. with Duncan Hunter??? As a former San Diegan, I am disappointed with those folks. Republicans supported and elected three people under indictment (Rep Chris Collins-NY, Rep Duncan Hunter-CA and Texas Attorney General Ken Paxton) and one dead guy (Dennis Hoff in Nevada's 36th Assembly District). retail sales taxes, alcohol taxes, etc., is the Board of Equalization. The Board of Equalization is no longer necessary. I will work to close it down. If you agree, I'd appreciate your consideration. Thank you, Tom Hallinan. Rather, his politics is wholly reflective of some of the whitest and racist parts of San Diego County. Against such a formidable array of willful ignorance, Democratic challenger Ammar Campa-Najjar -- who's a native-born American of Mexican and Palestinian descent -- never stood a chance, particularly after Duncan Hunter's father, retired Congressman Duncan Hunter Sr., took to the media to label him a threat to national security. It was despicable act, to be sure. But it was also terribly effective. But this morning I'm trying to focus on the fact that we're in a better place today than we were yesterday. Two steps forward, one step back. If only we hadn't taken 100 steps back in 2016. Maybe we'll finally get that infrastructure bill... Not holding my breath though. has now flipped blue many are projecting. The votes are not just coming in for McSally and Sinema keeps inching further and further ahead. 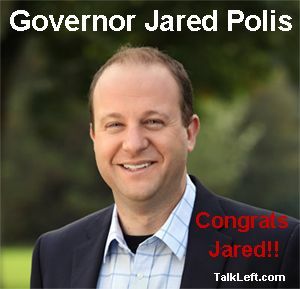 As J noted above, we elected our first openly gay Governor. In addition, Democrats took control of the Senate and increased their advantage in the House. They won every state wide office, including AG and SoS. Our new SoS is a bright young woman with a background in voting rights, Jena Griswold, who is someone I can see holding higher office (Gov/Senate) down the road. Also of note, two amendments were passed to take redistricting out of the hands of politicians. The Democrats and Gov. Polis have everything they need to put forth an aggressive agenda on health care, education, gun safety, transportation and the like. We went from purple to blue - in fact, there are only two state wide elected Republicans left, a CU Regent and Cory Gardner. Enjoy being tRumps lickspittle, Cory you're toast come 2020.
it looks like we are on our way to flipping the house. Only need 20 more seats. So far, I'm not seeing the blue wave everyone was looking for. Carville on MSNBC looked downright dejected. Locally, for me, MSNBC is projecting Casey and Wolf winners in PA. I am happy with that so far. Scott Wagner is nearly as repugnant as Bone Spurs. Certainly no early blowout for the Dems. The 34-seat pick-up for House Democrats is a pretty big deal. It's larger than the 31-seat margin in 2006.
a big deal with all the gerrymandering that the GOP has done across the country. Many pick ups likely there. Orange County went for Hillary by 9. So, the GOP's days are numbered here. And I have seen a popular vote projection of +10 nationally. That is larger than other "wave" elections. "Orange County, the California collection of 34 cities and 3.2 million residents once described by President Reagan as 'where all the good Republicans go to die,' died Tuesday. It was 129 years old. "Long famous for its wealth, whiteness and conservative values, Orange County is survived by its offspring, who include a population that is about 60% people of color, some of the most crowded and poor neighborhoods in the United States and a Republican Party that's on the ropes. Once reliably red, the official cause of O.C. 's passing is a case of the blue flu, which turned its politics more purple than Barney the dinosaur." going to take the house. The thing is it is not the blowout everybody was hoping for but the gavel goes to Nancy Pelosi as long as we win the seats. We knew TN would tell us early about the Senate. I'm happy enough with one chamber. And we are winning governors all over. Illinois Kansas. from southeastern PA alone (Dean, Scanlon, Wild). Still waiting on PA-1 (Scott Wallace); too close to call so far. All thanks to the fact that we won the state Supreme Court two years ago, which then struck down the Republican gerrymander, and imposed fair (federal) districts. Our state legislature, unfortunately, is still gerrymandered; next target. (Dems won Governor and Senate tonight, too, but those were not close.) Turnout in our heavily-D township, btw, was 75%. All over. Dave Bratt is losing. Gianforte (rep body slam) is losing. Chris Kobach lost. representing our corner of PA: Houlihan as well as Dean, Scanlon and Wild. Unfortunately, in the face of well-financed (and false) dark money attack ads, my friend H. Scott Wallace (grandson of 3d-term FDR VP Henry S. Wallace, who ran against Truman and Dewey for President in 1948 as a Progressive) narrowly lost his congressional race (1% margin) to a self-proclaimed "moderate" Republican, a former FBI agent. Still, we won four of five races in the newly de-gerrymandered districts. He was at 65% when I switched over to Netflix. That is a grand improvement. Feeling better about the House now. Still got my eye on Beto in TX. It's looking like a squeaker. No sooner that I posted the above, MSNBC projected Cruz to win. He will probably start running for president tomorrow and I'm ok with that. these projections. I wish they would just wait till all the votes are counted before they declare a winner. I think they should wait til they are all counted. I remember going to bed believing my guy had due to projections. Next morning the ra e had flipped to the other candidate. I thought Gillum was a sure thing. I just don't understand how the people here continue to vote for Rick Scott. Sure, it's disappointing, but look at it from a historical perspective. The 49% share of the vote won by both Andrew Gillum and Stacey Abrams in Florida and Georgia, respectively, is in itself an amazing accomplishment in those southern states. 20 years ago, such races with African-American gubernatorial nominees would not have even been remotely clos in the South. The GOP was compelled to resort to nakedly racist appeals and voter suppression in minority communities in order to pull out two squeakers. The long-term demographic trend is clearly tilted toward Democrats. A year ago, few people had heard of either Gillum or Abrams. These two races were always going to be an uphill climb for Democrats this year, and even more so for two African-American candidates. I'm very proud of both of them tonight. But I'm tired of Democrats claiming victory for almost winning. Almost means you go home and look for a job. There is no power in "almost." Rather than spark yet another round of armchair critiques and criticism from people who like to consume their politics vicariously, the Abrams and Gillum campaigns ought to inspire those armchair warriors who consider themselves Democrats and progressives to finally get off their a$$es, and join the active movement to take down and dismantle the racist white socio-political infrastructure which has long underscored the status quo and plagued the South. your comment is aimed at. As for me, I do what I am physically capable of doing. Which is vote. I display candidate yard signs in front of my house. I get out my checkbook. For the first time, since Bone Spurs was elected, I now contribute to candidates in places where I cannot vote. I never did that before. I write to my elected representatives (though I'm sure Scott Perry wishes I would stop). I can't walk more than a couple of blocks or stand in one place for more than a few minutes. Knocking on doors is not an option. I work full time and that for me, is a daily struggle. My wife has had to take on the added burden of helping get dressed in the mornings because of the problems with my legs. And for those reasons, I can offer criticism about Democrats taking victory laps when they lose. in Gillum's loss, I believe the "progressive" label was also a big factor. Florida was not ready to handle a twofer. I can be proud of Gillum and still lament the fact that he lost. DeSantis is going to get the opportunity to appoint 3 Supreme court judges :-(! It is starting to look like in addition to a recount for the Senate seat, we MIGHT also get a recount for Governor. In my Senate District 18, the democratic candidate Janet Cruz is ahead by just 289 votes. Also, headed for a recount. the things that are happening should put the fear of God in the GOP. It was like the initial voting had good news for them but there have been little earthquakes happening all over the country. It looks like Aunt Lydia Karen Handel is finally going down. We almost took out the rep in the 7th congressional district here. absentee ballot curing. Deadline is 5pm today. I was feeling a bit stressed because I couldn't make it but it looks like they have more than enough volunteers. I know it is a long shot but I am keeping my fingers crossed that this somehow works out for Gillum and Nelson. as a blue house fell on Handel. And GA7 still counting? once held by Gingrich and, then, the disgraced Tom Price (whose corruption was too much, even for Trump). The special election/runoff between Karen Handel and Jon Ossoff drew national attention, but it took gun-control activist, Democrat Lucy McBath, to defeat the Trump-supporting, anti-gay Handel. Aunt Lydia can now go back to Gilead. And I thought they had called the 7th but they are still counting. Woodall's lead now is down to 900 votes. We should know the final count tomorrow as I understand it. is surely lost. The senate seat might not be. I said that Florida Dems may have blown it by not picking Gwen Graham. Based on how the female democrats are doing across the country, it looks pretty accurate. you are probably right. Graham possibly could have run and won. Certainly she wouldn't have had the north florida rednecks show up in such numbers against her in the very least. in Florida I was a little shocked that Gillum did as well as he did. One of the biggest draws to move to Florida is there is no income tax as well as a rather low tax rate over all. There is a high gas tax which is justified by pols as putting a big burden on tourists who visit Florida. Gillum made it clear he would be raising taxes in his speeches. The thing is the guv really does not raise taxes, the legislature does and it is firmly in the hands of conservatives. Gillum also has the shadow of an FBI investigation following him. His former BFF who lobbied for CRA funds and got some big bucks had half way turned on him and released damaging statements about following the money. Without getting too far into the weeds as to why many Floridians view Tallahassee as one of the most corrupt cities in Florida and have for a long time. While it is easy to say Gwen would have been a better candidate she would probably have lost her seat in the House if she had run. Another factor in this race is that Michael has depressed voter turnout in the Florida Panhandle. There are still places around Mexico Beach where the roads are still impassable. Not to mention that many voters are doing things like fixing holes in their roof; assuming they still have a roof. While it is legal there are also lots of voters who distain big out of state donations going to a candidate and there were many ads about Soros and Bloomberg money going to Gillum. Also keep in mind that the Florida Republican establishment was not happy with DeSantis and felt dissed that Putnam was not the candidate. In a normal year with no Michael and an establishment Republican candidate my guess is Gillum would have done a lot worse. As for voting for Scott he did a bang up job after Michael. Some of his most telling ads were showing Nelson saying he spent a week in the Panhandle after Michael and did all he could with a split screen of Scott in a PR stunt handing out food and water well after Nelson left. Then in big bold letters the question was asked "What has Nelson ever done". But you mentioned the lack of income tax in Florida. I am a former Florida resident (Jax and Tampa area). I am also a former resident of Texas. Both states with no state income tax. I now live in PA where I pay Federal, State and local income tax. That said, I earn more money here than I ever would had I continued to live in either of those two states. Texas and Florida both have notoriously low wages. Florida most likely because the abundance of service work. Texas likes to brag about the companies moving there. I believe one reason for the relocations is wages. Companies know they can move to Texas and pay less. Both states have a gross lack of services. And high user fees. A mere seatbelt ticket in Texas can cost you upwards of $200 (but hey pols can claim its not a tax). I pay way less to register my car in PA. No sales tax on groceries or clothing. Otherwise it's 6% statewide. Sales taxes in Texas are near 10% in some areas. I don't remember what it cost in Florida. And I like having roads plowed within hours of a snowstorm. I've been in DFW during and after both ice and snowstorms. The entire region comes to a standstill. For days. Nothing moves. And if it does, it's usually a pickup truck off in the ditch. Seriously, I had to drive my Mini Cooper from Granbury to DFW airport right after an ice storm a few years back when my mother was still there. It's about a 60 miles drive. I counted no less than 37 pickups trucks in the ditch on side or in the median on that drive. Texans loves them some pick em up trucks. Ice, not so much. My point being, lack of a state income tax, is in my opinion, a red herring or smoke screen as to livability. You get what you pay for and/or you end up paying the state one way or another. undergrad degree in Tampa at USF and MS/JD in Tallahassee. I did see snow once in Tallahassee as a student and once after I graduated. It melted so fast that snow plows were unneeded. State tax is 6%(with food and medicine exceptions and a few others) but counties and cities can add to that. As I posted Florida has a high gas tax (course so do a lot of places) that means tourists pay a significant part of it. There is also a bed tax (for beds in hotels) that tourists pay the majority of. As for wages and cost of living/quality of life it varies greatly. In places like Miami wages and cost of living are fairly high while in more rural areas wages and cost of living are much lower. But there is a large portion of the population who are retired and wages are not an issue. There are also a lot of recent immigrants who are farm workers and have few options other than low paying jobs. No question Scott improved the economy, probably at a cost to the environment, and wages are increasing across the board. Not trying to defend him as he is not my favorite, but his attack on Nelson as a 'do nothing' pol and his asking voters to name anything Nelson had done hit home. My understanding is that state seat belt laws are a response to a requirement of federal funds for interstate highways. Not sure what tickets cost in Florida but I know a friend who got a $US193 ticket for a moving violation. My parents moved to Paris, TX after my Dad partially retired and went to work for the Indian Health Service as a doctor. One Christmas I flew into DFW right after an ice storm and my Dad picked me up there. He had snow chains and it was no problem for him on the roads. In a lot of places where snow is a kinda rare event when it does happen it can be a disaster for some folks; while more to the North it is a regular event they prepare for. One of my brothers lives in Ft. Collins and he gets snowed in sometimes. At some point no matter how well you prepare snow can over power everything. I have traveled enough and spent enough time in other places to have some idea what they have to offer. With an advanced degree and a JD I was able to make good money in Florida and if I had it to do over again I doubt I would change any thing including living and working in Florida. Just re-tagged cars in Maryland, very reasonable, sales tax reasonable, tax savings is a wash. Better mass transit here, healthcare is pretty wonderful, if you must drive here all the time it can get stressful but mass transit is downright relaxing once you know the system. Heck I don't even really have to know the system, missing a stop I always find something new to see or know about. And education here is just freakin stellar. Should have moved my disabled child here years ago. He managed to survive my stupidity thank God. They seem to have overestimated democrats all over. I must admit I would have expected them to underestimate them. to be +35 seats for the Dems. When everything is counted it will likely be +34 or +35. Pretty damn accurate on their House polling aggregator. Gillum, Bredesen, McCaskill, Abrams, Beto. always thought Beto was going to out preform the polls. The Fl polls were consistently way off, even the raw numbers that I saw(before modeling) showed a consistent 5-6 point lead for the dems so those results were very surprising. Perhaps under polling in the panhandle because of the hurricane skewed the results a bit, but it's hard to imagine that big a swing. My first impression is that the macro polling (ie nationwide generic house ballot) and the micro (ie individual cd's) preformed well, the state-wide polls, not so much, especially in FL. My guess is that the Republican rural strongholds were systematically under-polled. Of course in the back of my mind I cannot rule out some vote counting skullduggery. Understand how 18% of black women voted for DeSantis, we might understand a wee bit better how other polling was off. Looks like FL, TX, TN, AZ and MO are lost. I thought the Dems would pick up at least one of those seats. That was a 41-vote margin out of 33,707 cast. The GJ meets on Friday. Speculation things happen this week. Another crazy Friday. Mueller is 10 moves ahead of Cheeto. In a movie this would be the car chase scene. he has put Clovis' campaign manager on the beat? If only his middle name were Kenneth, he'd have "some really fine" initials. he started a freaking forest fire that the GOP is going to allow to burn for 2 months until the house changes hands. They will never do anything about all this. re-election to the US Senate. Tester was a particular target of Trump for having opposed Dr. Ronny Jackson as head of the Veterans Administration. Jackson was, allegedly, drunk on the job, created a hostile work environment, and distributed medications indiscriminately. However, Jackson did attest to Trump's terrific health status, including his weight at 239 pounds and demonstration of cognitive abilities with flying colors. Also, Democrat Ned Lamont was elected governor of Connecticut. Unconfirmed reports are that he will first move to declassify FISA stuff and that he will replace Rosenstein as directing the Muller investigation. Prez says nominee is in mind and will be named at a later date. at this point the only people that is going to work on is the same rubes he's been fleecing for quite a while at this point. It's amazing the lengths he has been going to in an attempt to protect a likely Russian asset like Carter Page. He might as well keep up the carny stuff right now because once the formidable Adam Schiff takes the place of Nunes it's game over with this kind of nonsense. And if he thinks he can do anything about the Mueller investigation at this point he's fooling himself. Mueller has gotten so much information and so much farmed out to states and federal districts that's it is too late for any monkey business from Trump to be effective. She broke three ribs in a fall in her office. One more than the two ribs she broke in a fall in 2012 that was not disclosed at the time. I am wondering about life time tenure for justices. Rehnquist should have retired earlier than he did and it was obvious that he was not functioning at 100%; yet he stayed on till the bitter end. FDR's ill advised attempt to force justices to retire at 75 may not be as bad an idea as it was at the tme when it was viewed a purely political. There were calls for RGB to retire when Obama was prez and the Dems controlled the Senate. Since Trump will have a majority in the Senate for two more years at a minimum, with the possibility of four more years as prez those calls seem to have been a good idea. Funny, so many protests have occurred since November 2016 I didn't realize that the protest we were all actually prepping for has arrived. Wow, how did this happen? What a horrible two years for all of us. Than last week. This is why winning the House was way more important than winning FL. What I will say, when going through hell keep going and we shall overcome. There are no other options. The house will not allow the investigation to be killed and buried. Also they should make it clear to republican senators they will be he'd accountable in two years. Republicans are set to have a very bad and vulnerable year in 2020.
wish I could share your optimism. tRump and the craven caucus hold seemingly unfettered power for the next 56 days, and even then it will probably take weeks or even months for the Dems to gear up. Even if he is eventually impeached, conviction in the Senate seems unlikely. Even 2020 is light years away for our Republic, meanwhile the damage these vandals can do is immeasurable. They sent letters today to everyone involved in the Mueller investigation that destroying any records would be a crime. I do not think this new DOJ tool will attempt to stop the investigation. The white house is hiring dozens of new lawyers. No doubt Trump picked him because of his views. The house democrats are spoiling for a fight. And republicans have given them the tools to win. "stern" letters are always a winner, I'm telling you they will burn down the DOJ if needed to win this fight. The Democrats have limited leverage in the short run, sure they can expose the rot but the electoral payoff is still years away. I'm also skeptical of the Democrats will to fight, they have rarely if ever showed any kind of killer instinct in my lifetime. Those "stern letters" are called preservation orders. If you do not believe Mueller has planned for this I don't think you have been paying attention. who appears to be a sane Republican (George, that is, not Kelly-Anne), co-authored an op-ed in the NYT with Neal Katyal, who was Solicitor General under Obama, opining that under the Constitution's Appointments Clause Whitaker cannot serve as Acting Atty General, because he does not presently hold a Senate-confirmed position. Here's a different and rather detailed analysis. Is that guy is a regular legal guy on FOX NEWS. My speed read of your link seemed pretty positive for the rule of law. To me. This strict reading of the Appointments Clause is based on Justice-Thomas-style "strict construction"/"textual" constitutional law theory. Not the position that liberal constitutional law experts would be expected to take. Believe it or not, constitutional law reasoning is not always and everywhere a mask for partisan politicking. I'm paying attention, I'm fkng obsessed with this sht. I have a fair amount of confidence in state charges being brought if needed, however those will also take some time to gear up and it's unclear constitutionally if tRump himself can be prosecuted by a state while in office. Meanwhile we have a full-blown criminal syndicate in charge and I am not being hyperbolic, that meanwhile terrifies me. We have had one for two years. I can hold off igniting my hair for 2 months. years of of un-cornered rats, as the walls get tighter the danger mounts. me my, analysis of the situation is mine and mine alone, I've always been a pessimist and even this blue wave does not boost my confidence that much. It was a wave. Largest democrat gains since post Watergate. It's the largest number of seats Democrats have won in a single election since Watergate. Votes. It's possible republicans only gain one Senate seat in spite all the suppression BS and 2018 being the favorable environment for republicans in decades. he knows the votes are not there for him in the senate. He is having a literal meltdown. There seriously must have been some fraud going on in Florida and he's up to his neck in it. Maybe even Gillum will pull it out in a recount. We can always hope. He rescinded his concession. bout 25,000 ballots in Broward Co, a major democrat county, have no vote for senator. Just blank. Among other things we know so far. But I agree totally about the desperate. I went to bed Tuesday night thinking Tester Sinema and Nelson all lost. Now maybe all three win. be awesome if we got all three. So far we are at 2 out of 3. Republicans are saying that there is no way McSally is going to make up the votes because the areas that are coming in are just expanding Sinema's lead FWIW. Florida governor Rick Scott is launching a lawsuit based on the claim first floated by Sen. Marco Rubio (R-FL) that Democrats are trying to "steal" the state's election. Why is it always projection with these guys? "No ragtime group of liberal activists or lawyers from DC will be allowed to steal this election from the voters in this great state," Scott said in a press conference where he announced his voter fraud lawsuit against Broward County Supervisor of Elections Brenda Snipes for the county's slow-going absentee ballot counting. like the Preservation Hall Jazz Band? I've heard of a ragtag group..
...this: Best Ragtime Musicians in Liberal, KS. But the bands listed are far from Liberal - at least 300 miles away. I just can't resist the easy opportunity to make sport of Rick Scott's behavior. Florida governor and Senate candidate Rick Scott demanded an investigation be opened into allegations of voter fraud in Broward County -- but apparently did not submit an official request for one. Democrats also made significant headway with attorney general positions. The party picked up new attorney general seats in Colorado, Michigan, Nevada and Wisconsin, and 27 of the country's attorneys general will be Democratic this year. Gotta say I would love to get the job of making anti Flake commercials.